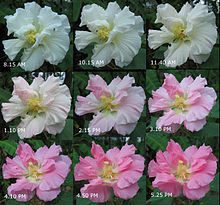 Hibiscus mutabilis, also known as the Confederate rose, Dixie rosemallow, or the cotton rosemallow, is a plant noted for its showy flowers. Confederate roses tend to be shrubby or treelike in zones 9 and 10, though it behaves more like a perennial further north. Flowers can be double or single and are 4–6 in (10–15 cm) in diameter; they open white or pink, and change to deep red by evening. The 'Rubra' variety has red flowers. Single blooming flowers are generally cup-shaped. Bloom season usually lasts from summer through fall. Propagation by cuttings root easiest in early spring, but cuttings can be taken at almost any time. 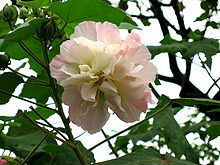 When it does not freeze, the Confederate rose can reach heights of 12–15 ft (3.7–4.6 m) with a woody trunk; however, a much bushier plant 5–6 ft (1.5–1.8 m) high is more typical and provides more flowering. These plants have a very fast growth rate. The Confederate rose was at one time very common in the area of the Confederate States of America, which is how its common name was derived. It grows well in full sun or partial shade, and prefers rich, well-drained soil. Flowers are white in the morning, turning pink during noon and red in the evening of the same day. Under laboratory conditions, the color change of the petals was slower than that of flowers under outdoor conditions. Temperature may be an important factor affecting the rate of colour change as white flowers kept in the refrigerator remain white until they are taken out to warm, whereupon they slowly turn pink. The red flowers remain on plants for several days before they abort. Weight of a single detached flower was 15.6 g (0.55 oz) when white, 12.7 g (0.45 oz) when pink and 11.0 g (0.39 oz) when red. Anthocyanin content of red flowers was three times that of pink flowers and eight times that of white flowers. There was a significant increase in phenolic content with color change. Overall ranking of antioxidant properties of H. mutabilis flowers was red > pink > white. Subramanian and Nair postulated that anthocyanins in pink and red flowers of H. mutabilis are synthesized independently since there is no reduction in phenolic content. However, Lowry suggested that anthocyanins are formed through direct conversion from flavonols as they have structural similarities. ^ Ng, F.S.P. (2006). Tropical Horticulture and Gardening. Kuala Lumpur: Clearwater Publications. ISBN 983-42954-0-5. ^ Lowry, J.B. (1976). "Floral anthocyanins of some Malesian Hibiscus species". Phytochemistry. 15: 1395–1396. This page was last edited on 21 October 2018, at 00:54 (UTC).